Bhutan is the only country in the world to retain the Vajrayana form of Mahayana Buddhism as its religion. The Buddhist faith has played a fundamental role in the cultural, ethical and sociological development of Bhutan and its people. Annual festivals (Tsechus and Dromchoes) are spiritual occasions in each district. The Dzongs, which were built in every districts in the Middle Ages as fortresses function as the centre of both religious and secular activities now a days. The district monk body practices their faith through dzongs. The dzongs remain most of the time closed and are open to visitors during festival time for preserving kingdom's religious environment. Chortens (Stupas) are most common throughout the kingdom and they ward off evil spirits and protect from imminent danger. They represent the mind of Buddha symbolically and remind people of the possibility of and the path of enlightenment. Even more common are the prayer flags on mountain slopes, bridges and high passes. Transmitting prayers to the Gods and keeping up a constant communication with the heavens, prayer flags fluttering in the wind are a simple reminder of the clarity of the Buddhist faith. At 7,710 ft in the fertile valley of the Wang Chu River, the capital Thimphu is an engaging blend of the old and the new. A unique law, which retains the forms and motifs of Bhutan's traditional architecture even in new buildings, give Thimphu a delightful structural harmony. The capital's most striking visual landmark is the magnificent Tashichhodzong, which is the seat of the seat of the Central Government, where both the temporal and spiritual heads of the country preside. The dzong was rebuilt in the 1960s on the ruins of an early structure. 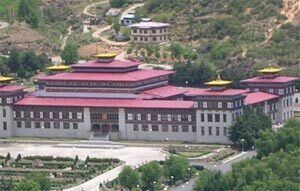 A number of institutions in Thimphu such as the Royal School of the Performing Arts, the School of Traditional Painting and the Institute of Traditional Medicine offer the visitor an insight into Bhutanese culture. Visit the Memorial Chorten, built in the memory of the Late King. Stroll through town. One may be able to catch a game of archery in progress at the Changlimithang ground, below the town. Other attractions include the National Memorial Chorten, the Handicrafts Emporium, the National Library and the quaint weekend market. At 7,382 ft Paro is the site of Bhutan's only airport and is the most beautiful western valley. Paro is a picturesque valley with clusters of hamlets amidst terraced paddy fields. Although the site of the nation’s first airport, Paro still retains tradition by way of architecture and the simple way of life. Besides the colourful spring tsechu, Paro has a number of sights and monuments to enthral the visitor. The pastoral beauty of Paro valley, magnificent views of Mount Jhomolhari, the incredible monastery of Taktsang which clings to a sheer rock cliff, the ruins of Drukgyel Dzong (fortress of the victorious Drupas) and the National Museum, housed in an ancient watchtower, are a few of the attractions that make Paro one of the high-points of any holiday in Bhutan. At 4,300 ft Punakha with its sub-tropical climate is Bhutan's ancient capital and winter seat of the Central Monastic Body. It used to be the old capital of Bhutan and remained so till the late fifties when it was shifted to Thimphu. The unique Pungthang Dechen Phodrang Dzong, built in 1637 by the Shabdrung, is situated on a triangular spit of land at the confluence of the Mo chu and Pho chu river. Punakha has its own festive, the Punakha Dromchoe that concludes with the Serda, a colourful re-enactment of an episode of the war against the invading Tibetans in the 17th century. The body of the Shabdrung, who died in 1651 while in meditation at Punakha, is preserved at the dzong. 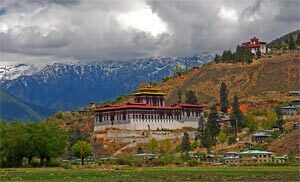 At 4,300 ft Wangduephodrang is distinguished primarily by its dzong, which completely covers the spur of a hill and commands excellent views of both the east-west and north-south routes. It is another place worth visiting and is situated on the top of a mountain spur that separates the Sankosh and Tangchu rivers. A broad glacial valley (10,000 ft) on the flanks of the Black Mountains, Phobjikha with gently sloping hillsides encloses a space of astonishing beauty described as "the most beautiful valley in the most beautiful country in the Himalayas". It is the chosen home of the rare Black-Necked Cranes which migrate here in the winter from Tibetan plateau in the north. The valley of Gangtey is one of the most beautiful places in Bhutan and houses the century- old Gangtey monastery. Gantey also has a very interesting Nyingmapa monastery, the only one of its kind west of the Black Mountain range. The undulating and verdant valleys of Bumthang are known for their beauty, temples and palaces of historical significance. It is here that the kings are cremated and the present royal families trace their ancestry back to the famous saint, Pemalingpa. Bumthang offers some of the best treks in Bhutan, ranging from easy walks in the idyllic countryside to extended treks to explore hidden alpine valleys, where the warm, unquestioning hospitality of the people and the pristine beauty of the land belong to another age. At 3,773 ft Trashigang is the biggest urban centre in eastern Bhutan. Trashigang is known for its woodwork and fine weaving. Trashigang dzong, built on a spur, overlooks the Gong Ri river, 1,300 ft below. In winter, handsome semi-nomadic people from the northeastern glacial valleys of Merak and Sakteng, dressed in their characteristic burgundy jackets, come here to sell their cheese, butter and yak wool. This fort is perhaps the most majestic in the country. This structure is relatively new having replaced the old one which was stated to have built by a king called Chushi Myangur a thousand years ago. 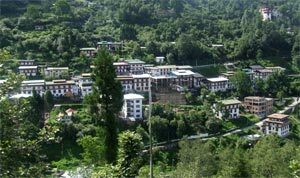 Trongsa is a strategically located town on the east-west route. The sprawling dzong is built on a spur and the view of the Mangde river valley extends for many kilometers. 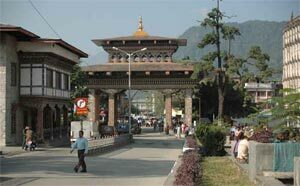 Located in the southeast of Bhutan, the border town of Samdrup Jongkhar is the eastern overland gateway to Bhutan. During winter months eastern Bhutanese come to this trading town to sell there hand-woven textiles and other wares. Exit from Bhutan can be made through this point also. This frontier Bhutanese town is approx. 3 hours drive from Guwahati, the capital City of Assam State. Samdrup Jongkhar is the authorised exit point only and an important link for visiting north-east India. Phuentsholing, the southern Bhutanese border town is a bustling trading town and the overland western gateway to the Thunder Dragon Kingdom. Bagdogra, in the state of West Bengal (India) is the nearest airport approx. 04 hour drive from this place. For travelers wishing to visit Indian states of Sikkim, West Bengal along with Bhutan, Phuntsholing serves as the convenient point. Bhutan offers great opportunities for trekking with its splendid scenic beauty, lofty mountains and deep valleys intemperate by modernization. It provides scenic beauty, which gradually unfolds in all its glory and charm. Lifestyles change from the colorful lively pace of Thimphu, the capital of Bhutan, to the more traditional, simple remote mountain villages only traveled to by foot. The scope for trekking in Bhutan is immense from short walks to arduous treks. Trekking gives an opportunity to see the beautiful Kingdom of Bhutan at its most magnificent form. Most trek routes follow the old trading route between different valleys. From the towering snow peaks of the inner Himalayas to the verdant forests which cloak the hills above its peaceful valleys, the trails are clean, unspoiled, and the wilderness still pristine in its’ beauty. The following itineraries offer enchanting vistas of the Himalayas. All our trekking programs are well planned and accompanied by efficient, trained team who take care of all the necessities. Our itineraries only cover the trek programs in order for you to be able to choose and combine with any of our cultural tours. To make most of your holidays, enjoyable, it is essential that you choose one within your capabilities. Following grade approx. describe the treks. However you should ask for more details to know the exact grade. *: These trips can be enjoyed by anyone leading a reasonable active life. Normally the walking part is up to 5 –6 hours a day and the ascents are less then 500 ft.
**: These trips are mix of some longer and shorter walks. The ascent can sometimes go up little to more than 500 ft. Walking hours are normally 6 – 7 hours. Hill walking experience is desirable. ***: The day stages on these trails are combined with strenuous and moderate walks, which normally takes 6 & 8 hours day. **** These treks are regarded as genuine adventure. An experience of mountaineering with the capabilities of carrying on normally at an altitude of 4000 – 5000 Mt. and possessing a degree of good stamina is desirable. Duration of walking can be sometimes 8 to 9 hrs. a day. Trekking in this Himalayan kingdom is one of the most wonderful experiences a visitor can have. It is quite different from other parts of the Himalayas. The country ranges from the dense forest of subtropical jungles to the alpine shrubs, endowed with a wide spectrum of Himalayan flora and fauna. The land is thinly populated with scattered settlements. A person may walk for several days before sighting a village. Trekking in Bhutan is a fairly recent development, although the Himalayas have always held a long-standing attraction to the Western world for trekking and mountaineering. The beautiful landscape, unique architecture, snowcapped peaks, colorful dzongs, Lamaist Buddhist traditions and friendly people leave an everlasting impression on the visitor. All trekking parties are accompanied by a trained guide, a cook, an assistant and at least one horseman. The support crew walks ahead of the trekking party each day and pitches camp before the trekkers arrive. A warm cup of tea or coffee waiting in the dining tent is the welcomest treat after hours of walking. All meals are carefully planned. Breakfast is always hot and dinner includes a choice of at least four dishes. In many of the remote parts of the country, villages are scarce and few people cross paths, therefore Adventure Silk Road (or its counterpart) takes every precaution to ensure the safety and comfort of trekkers. Altitude sickness is an acute problem for trekkers, in Bhutan. Almost all of the designated treks go above 3,000 meters (9843 ft.). Those who have not properly acclimatized or suffer from altitude sickness are advised not to trek. If you are not used to high altitudes it is a good idea to start slowly and allow yourself to acclimatize.Adventure Silk Road (or its counterpart) offers a number of treks, which cover most of the central and northern parts of Bhutan. Each trek has its own beauty and charm. A few are difficult treks are suited for people of good physical fitness. Yet others are for any age group, not too long or strenuous, with visits to places of interest. Things you would need to bring on trek include sleeping bags, foam mattresses, strong comfortable trekking boots, cap/hat, sunglasses, sun block, flashlight, insect repellent cream, and personal toiletries and medicine, and rain gear during the rainy season.